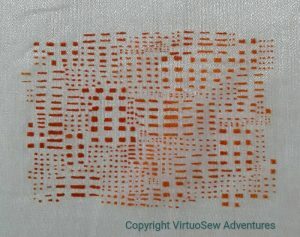 I decided, as I stared at the printing of this blocky pattern onto gauze, that I wanted to use the transparency of the gauze as part of the finished effect. 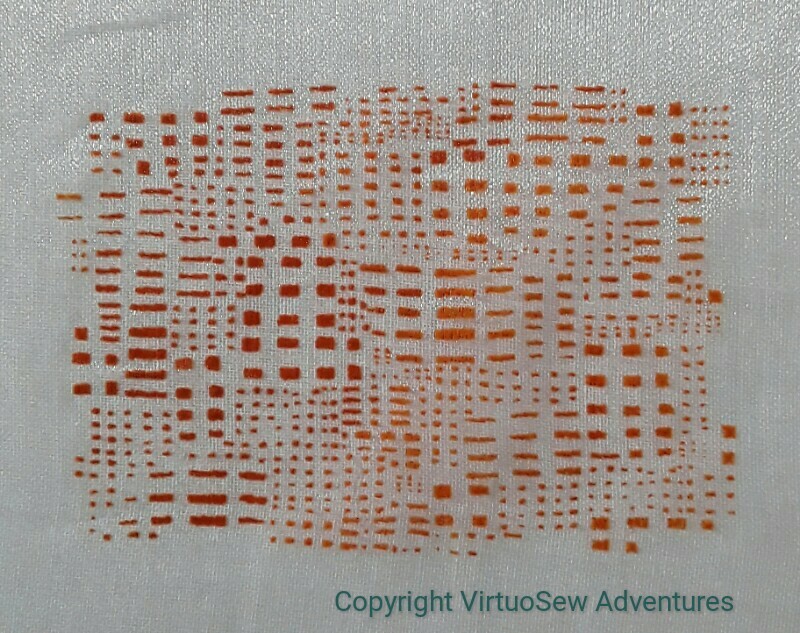 I don’t have a destination in mind for this piece which will give me a theme, so I decided that, in order to highlight that one quality, I would use a single thread (as it happened, a variegated silk), and design a fragment that would allow me to experiment with the effect of stitch cover and openness. I leafed through books about pattern, saw nothing that gave me the combination I wanted, and then evolved the fragmentary organic sketch on the far left to give me the balance of line and form I was looking for. Incidentally, this is quite possibly the swiftest and shortest progression of any sketched design I’ve ever come up with! 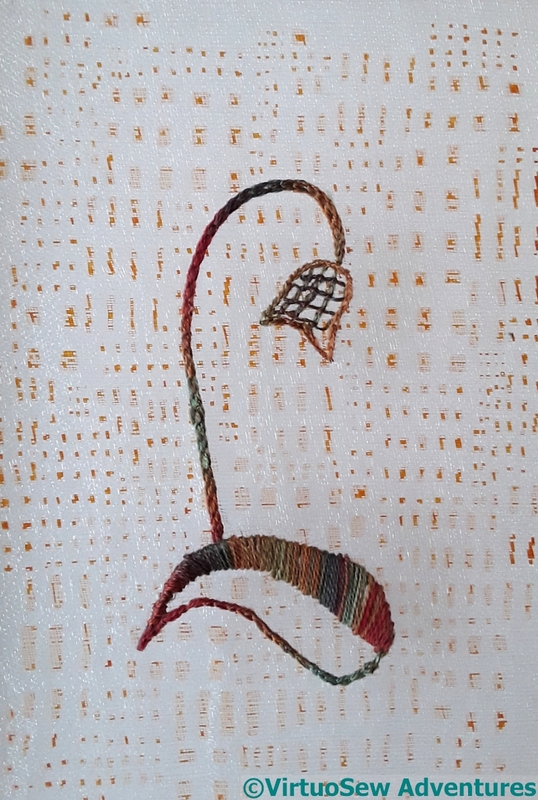 It’s astonishingly difficult to trace a design onto a fabric which is essentially invisible, and still harder, I might add, to follow the lines when you have finally put them there! 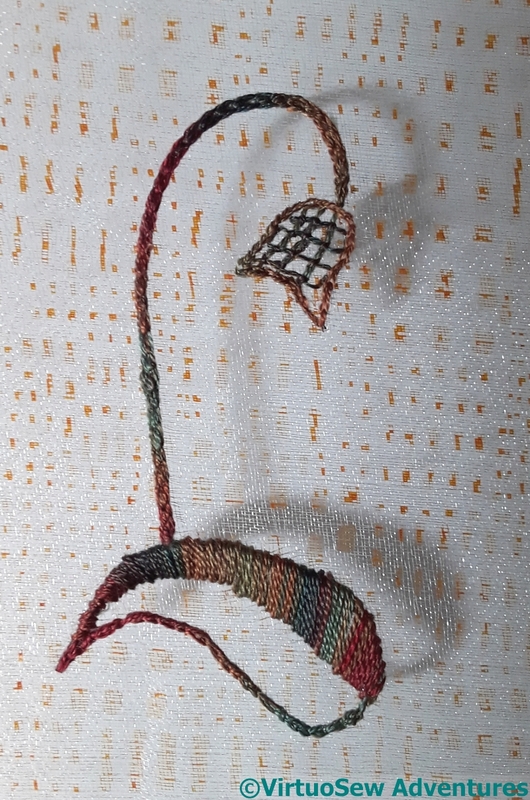 I used Hungarian Braided Chain Stitch for the stem, satin stitch for the solid side of the leaf, and Jacobean trellis for the flower-head. Clearly that gives me a solid coverage, and a firm line; I was hoping that the Jacobean trellis might offer a sort of half-shade. A qualified success, I’d say. The printed pattern doesn’t create a shadow, and the Jacobean trellis shadow isn’t a sort of half-depth. But, my goodness, the shadow of the stem and the leaf work exactly as I hoped! 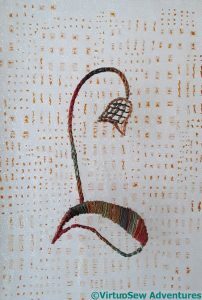 The gauze itself almost disappears, leaving the printed pattern floating above the surface, and the leaf and flower thrown forward by their shadows. The shadow makes all the difference! What a marvelous discovery! The shadow is absolutely perfect. Wow – amazing. And I love the orange background pattern. What a clever idea! It looks wonderful and the shadow makes all the difference. As a good friend of mine would say – Cool! I love the way it floats. Well done. wow, what a fabulous effect! Wow! That looks sensational. Love the design and the throw of the shadow is stunning. That’s a fantastic effect – the last picture looks like the block printing is actually the background, behind the gauze – it almost has no connection to the flower! Wild! Wow!! You’re awesome!! I am wordless!! It really does float off the background. Very clever. And the variegated thread gives it enough interest on the surface. Very artistic ! You are brilliant. I really like these. You have such wonderful experiments that work out so well.